2. 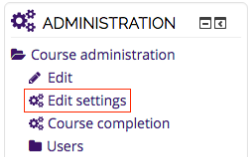 Click on the Edit settings link in the Administration block. 3. Go to the Course format drop down. 4. Set the format to Weekly Format. 5. Select the proper Number of Weeks in the semester. 6. Select the desired Start Date in General settings: day, month, and year. NOTE: The start date only determines which dates will display on the content areas for each week. It does not affect when your course will be available to students. 7. Click the Save and Display button on the bottom of the page. This should return you to your course, and display it in the correct weekly format.